The Big Ten and Pac-12 Conferences played to a split in challenge action Friday, as #11 Illinois swept #20 Colorado and #10 Washington topped Iowa in 4. No. 11 Illinois swept past No. 20 Colorado to collect its fourth win of the season and its second over a Top 25 opponent Friday in the Big Ten/Pac-12 Challenge. The Fighting Illini limited the Buffaloes to a .095 attack percentage, while posting a .235 attack percentage of their own in the victory. Set 1 contained 5 early ties before Illinois went on a 6-1 run to stake an advantage. The Fighting Illini went on to win the game by 6, 25-19. Colorado fought for control in the second set and was up 21-20 late, but Illinois came charging back, outscoring the Buffs, 6-3, to pull out the 26-24 win. In the third set, Illinois scored 5 of the first 7 points for the early lead and never gave it up en route to its 25-21 win. Junior Jacqueline Quade registered 13 kills for Illinois and posted a .300 attack percentage. Senior Jordyn Poulter dished out 35 assists to pace the Fighting Illini, while junior Caroline Welsh posted a team-high 11 digs and senior Ali Bastianelli registered 5 blocks. Junior Justine Spann led the way for Colorado with 10 kills. Sophomore Brynna DeLuzio distributed 16 assists, and junior Rachel Whipple logged a team-high 12 digs. The Hawkeyes started off strong, but ultimately succumbed to No. 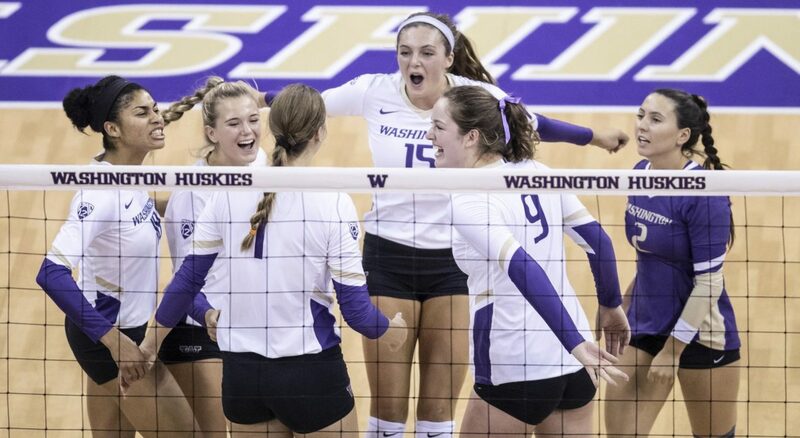 10 Washington 3-1 in Big Ten/Pac-12 Challenge play Friday night. The teams battled back and forth for the opening set, which contained 8 ties. The Hawkeyes used a 4-point run to pull ahead, 23-19, with kills by senior Taylor Louis and senior Reghan Coyle and a pair of errors by the Huskies. Iowa held on from there, registering the 25-21 win. Iowa jumped ahead again in the second set, establishing a 13-10 advantage midway through. Washington responded with 6 consecutive scores to seize the momentum and the lead, 16-13, and withstood a late Hawkeye push to even the match with a 25-22 win via a Lauren Sanders kill. After trailing for the majority of the third set, the Huskies fought their way back into the match 19-19. Four ties followed before Washington could collect the 25-23 win with an Iowa attack error and kill by freshman Ella May Powell. The Huskies carried their positive momentum into the fourth set, pulling away from the Hawkeyes with an 11-4 stretch. Washington won the finale by 9, closing out the match 25-16. Junior Kara Bajema collected a double-double for the Huskies, leading the team in kills (14) and digs (12), while Powell paced the team with 45 assists and contributed 13 digs. Sophomore Samantha Drechsel (13) and senior Destiny Julye (12) also tallied double-figure kill totals in the win. Junior Cali Hoye posted a double-double for Iowa, logging 16 kills and 10 digs. Louis (18) and Coyle (12) also reached double figures in kills. Sophomore Brie Orr notched a double-double of her own with a team-high 31 assists and 11 digs, while senior Molly Kelly led the way with 16 digs.